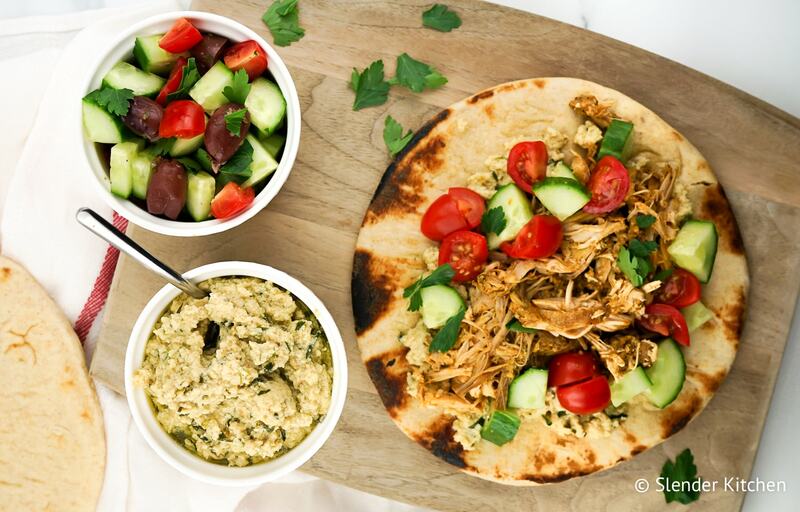 This healthy Chicken Shawarma couldn’t be easier to make with options for the slow cooker, instant pot, or grill. With just 218 calories and 1 Weight Watchers SmartPoints, it’s the perfect option for a pita sandwich, meal prep bowl, or salad. As someone who absolutely loves a good chicken shawarma pita, it has always remained one of those dishes that I thought was better left to the experts. Living in Los Angeles, we are lucky that there are a ton of great places to get it so up until a few weeks ago when a reader requested a chicken shawarma recipe, I hadn’t really considered giving it a try. However I am so happy I did. 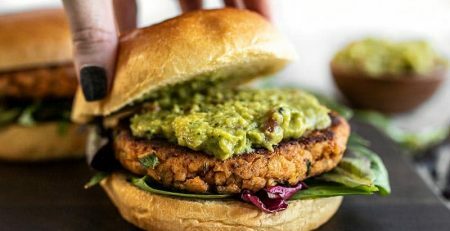 Not only is it really easy to make, it’s much healthier than the take-out version. Plus its made with a handful of spices you probably already have at home. Dinner win. Now to be fair, this is more like shawarma flavored chicken. We are missing the vertical spit that it is traditionally cooked on for hours where it picks up tons of flavor from cooking in its own fat and juices. But I promise you, this is still really, really good. 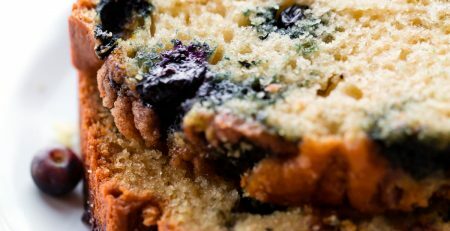 It’s got all the right flavors and couldn’t be simpler to make. 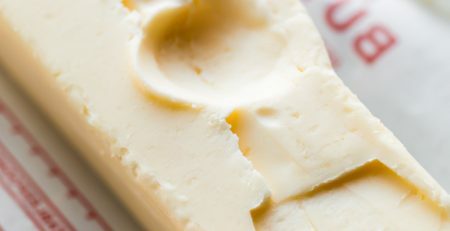 I plan on cooking it in the slow cooker and Instant Pot during colder months and then throwing it on the grill when its hot. 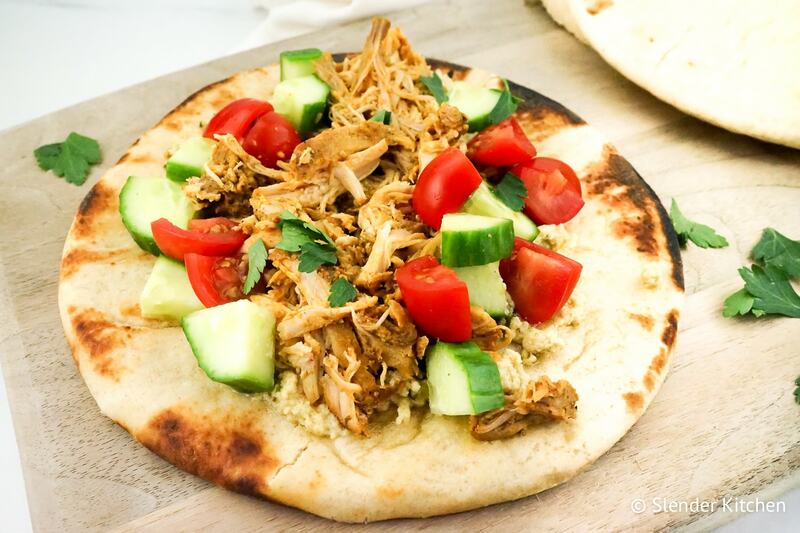 Slow Cooker Chicken Shawarma: This is probably the version I will make the most often since I can toss everything into the crockpot and forget about it. My plan will be to marinate the chicken the night before and then toss it in the slow cooker around lunch time so it’s ready for dinner. 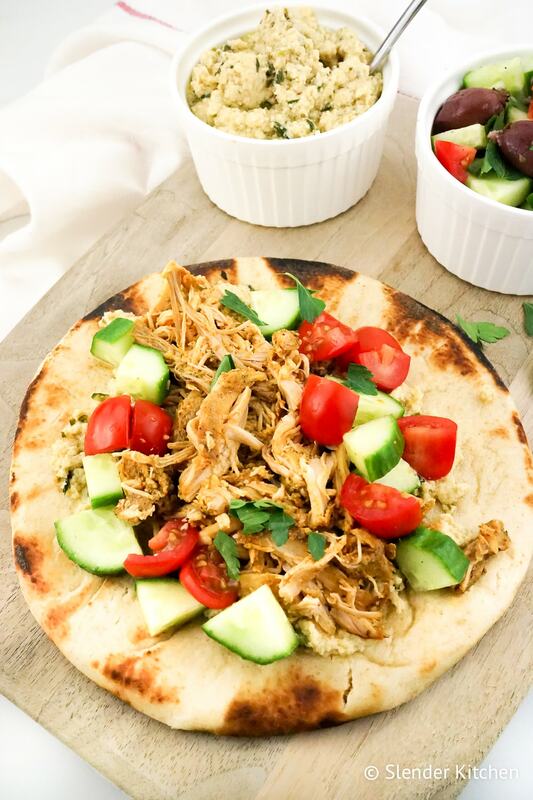 Instant Pot Chicken Shawarma: The more I use my Instant Pot, the more I like it. Normally for chicken breast, I like to set a manual timer for between 5-10 minutes depending on the size of the breasts. Then I let it natural release. You could also use the chicken setting. Grilled Chicken Shawarma: Once it is warm outside, I can’t wait to make this dish on the grill. It will add some smokiness and help get the crispy outside on a traditional chicken shawarma. Getting it Crispy: If you opt to cook it in the slow cooker or Instant Pot, you may miss that crispy outside. You can still get it using the broiler to crisp it up or lightly frying it in a skillet. You can’t talk about Chicken Shawarma without talking about the toppings. Whether you are making traditional pita sandwiches, meal prep bowls, or salads – it won’t taste like a real shawarma without some extras. Tabbouleh: There are all kinds of different tabbouleh recipes out there. One of my favorites is this Quinoa Tabbouleh with Lentils, which is a heartier version of the traditional barley based salad. I love making up a batch of this and serving the chicken right on top. Garlic sauce: Traditional Lebanese garlic sauce is made with a combination of garlic and canola oil, and although it is really delicious, it’s also super high in calories and fat from all the oil. I like to make a garlic yogurt sauce instead. This one is really delicious and much lighter. Hummus: Hummus isn’t traditionally served with shawarma, but many people like to add it. You could make homemade hummus, this artichoke one is delicious, or use store bought. Drizzling tahini is also an option. Israeli Salad: This cucumber and tomato salad is a great option for a pita topping or side dish. My favorite version is this chopped Israeli salad with lemon and fresh herbs. Heat: I love a little but of spice with everything. For shawarma I love using store bought harissa. Also Trader Joe’s has a MIddle Eastern cilantro and jalapeno hot sauce called Schug that’s killer. You can find it near the hummus and pesto. Grains: If you aren’t wrapping the shawarma in a pita, then rice is the next traditional option. You could also use quinoa or cauliflower rice. This is a great recipe for meal prep. Make up a big batch on Sunday and then pack it for quick weekday lunches. Usually I will pack a couple with grains, cucumbers, tomatoes, and yogurt sauce on the side. The others I will pack up to make quick pita sandwiches. Calories 216, Total Fat 7g, Total Carbohydrate 2g, Protein 33g, Serving Size 6 oz.